Again, current events. This is more important than not. In the most serendipitous of moments time rolled on for us as though it were a wheel because we asked it to. Then it again became it’s true layered self; a figment of our imagination. We curl our lids and pray it to be. I’m reading The Old Man and the Sea to Gavin. Generally I read to him when we put him down to sleep. Gavin enjoys talking at us with a few words only he truly understands. Megan and I feel we have learned five of them to the best of our ability. Either way, we talk back, and he makes funny faces and smiles often. I’ve chosen an Ernest Hemingway book to be the first full book I read to him because I believe infants need to hear words. Many of them. Not just, cat, dog, and hi baby. I think they are able to stuff these brilliant sounds into their growing brains far better than we know. We humans, especially adults, love to think we know everything. Then, we look at blooming teenagers and remind them they don’t know everything. Scratch that, I will never tell a teenager they don’t know everything because it’s possible they do and it’s possible I know so little that maybe I ought not be like all the adults I believed I truly knew more than. Anyway, we read to Gavin. 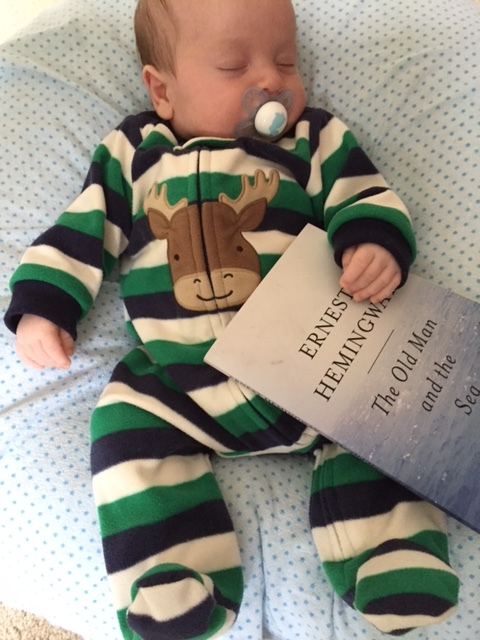 The first time I opened the book I told him who Ernest Hemingway was and when he was born. I then told him he wrote many books, one of which is the book I was now going to read to him. Gavin feel asleep after the first paragraph. He’s rebounded nicely and seems to listen for much longer stretches of time before nodding off into his dream land. Gavin- p.s. Three nurses came to visit you yesterday. Megan wanted to learn how to stretch your little body so you could grow perfectly well. We learned a few interesting things about you. The nurses did a number of tests. It turns out all of the fun facial expressions you’ve been making, and the number of words you’ve created and use are what’s considered to be advanced. I don’t care what tests say about a person. But, I thought you might like to know. One of the categories you were tested on was called expressive communication. Normal values were from 40-60. You scored a 73. They also said you’re very handsome and that we should send your picture to Gerber. 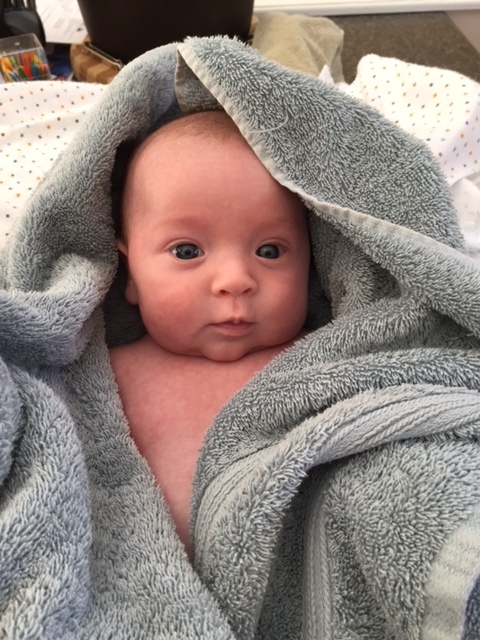 So, now your mother is sending your picture to Gerber. Isn’t it odd that our society is attaching test scores to you? You aren’t yet two months old. We’ll talk about test scores and society much more. Just remember, it’s important to be happy and to truly know yourself. Society hasn’t gotten there yet…so be careful when talking heads lean in closely to speak in your direction. I’m rambling. I’m going to post this now and then go kiss your forehead. You’ll most likely grunt. He walked farther into the Forrest with his son. He wanted to tell of the tree with the face. He could’t find it. As they searched he told the boy of how the tree must have uprooted itself and moved on because it was alive enough to have a face and speak and could certainly move about the woods as it pleased. The boy listened and took notice of the tone his mother had warned of. It took on a note of story telling and mistrust grew from each story. His father crossed a brook then hurried up a slight ravine and happened upon an eleven. See son, these two fallen branches make an eleven and they are showing us the way to the tree face. These were put here as a marker for you and I. There’s no way for them to simply be. They are for us, his father said with great seriousness. His son looked at the Forrest floor wearing a look if sadness. What’s wrong, his father asked. The boy replied, do you ever want to tell and not describe? What do you mean, his father pressed. That’s maybe not an eleven put here for us, the boy replied. No? He looked at his son with an irritable glance. Then what is it? His son answered, two sticks not laying down. Why bother do a thing as to think? The boy asked the rock. Why bother? That’s like asking light to crawl to its sprint and then not to bend. It’s already happened and will continue and now let’s even say it’s possible to bend quicker and travel faster. Thinking isn’t over. No. It’s just begun. If anyone knows where I could submit my Odd Walking Thoughts, please contact me.